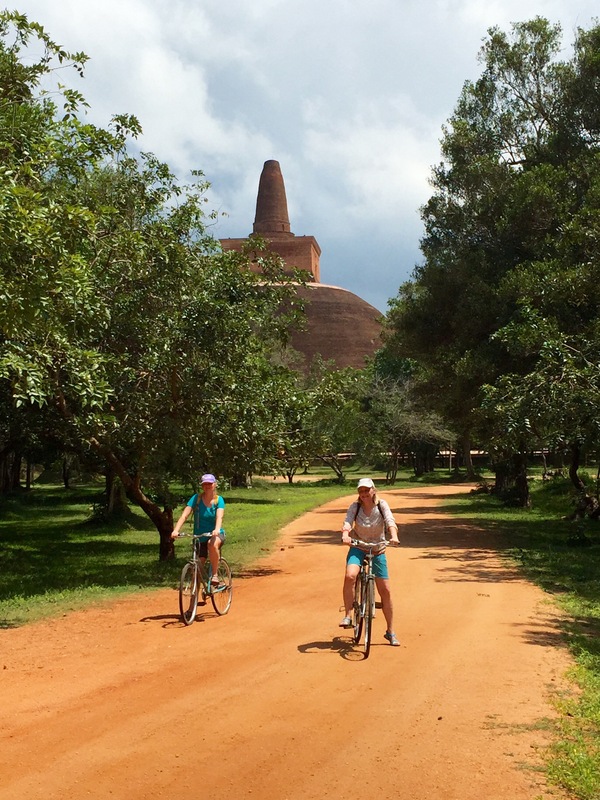 If you’ve done a lot of travelling and it takes a lot to go ‘wow’, Sri Lanka is for you. 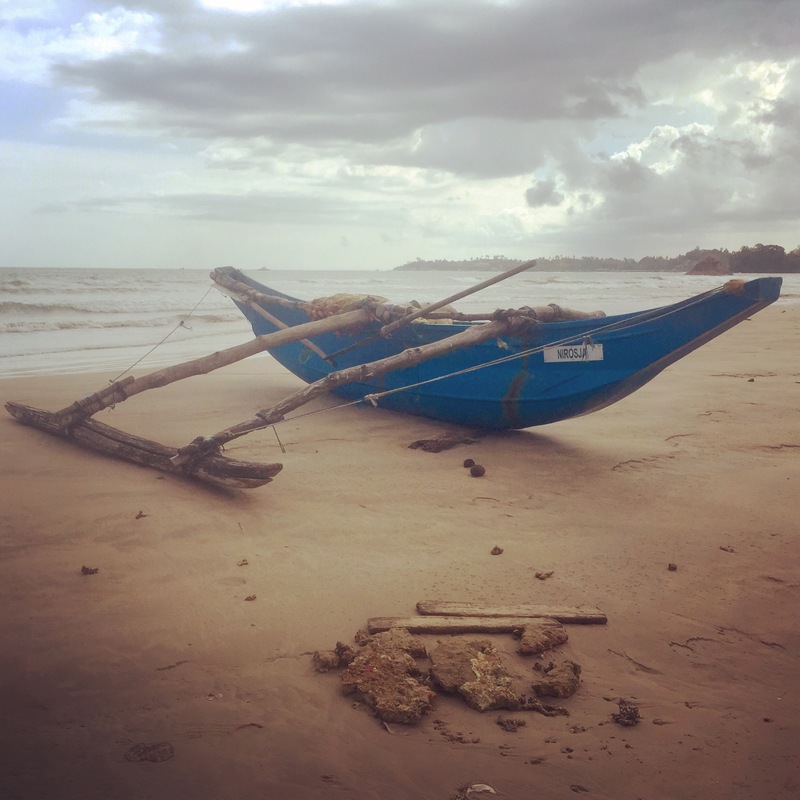 The tear shape island in the Indian Ocean offers spectacular scenery, abundant wildlife, locals who take friendliness and welcoming to a new level, and a rich culture. Oh, and the food is absolutely delicious; aromatic curries, coconut roti, exotic fruit and juices. We didn’t do much planning before heading out apart from reading a few blogs and getting some recommendations from friends. The train weaved through villages and towns for about 3 hours as food vendors did laps up and down the carriages selling roti, samosas and lentil vadai (patties). If you’re happy eating local food, you don’t need to take any snacks for the trains or buses. 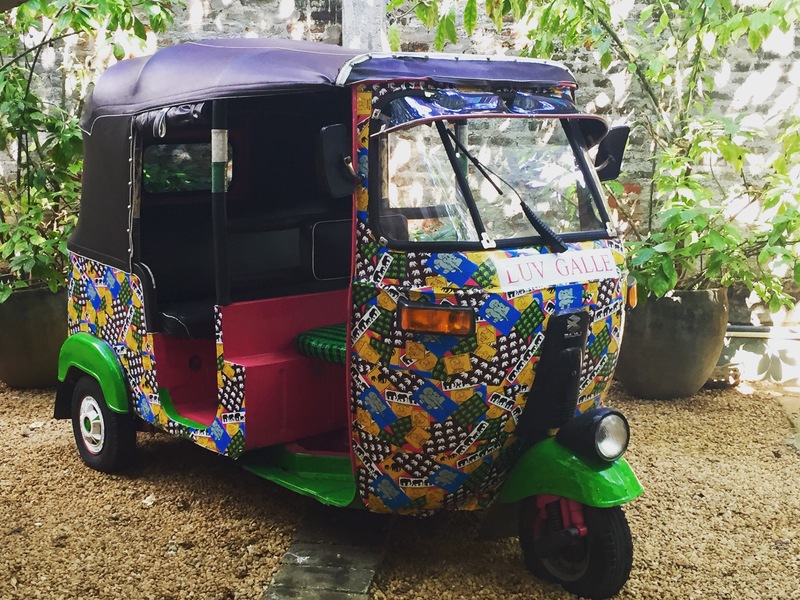 Our guesthouse (Kutambaya Resort) was a couple of km from the train station and given the heat, we caught a tuk tuk. Over the two weeks we got better at jamming ourselves in with our backpacks. Our host recommended Milano for food and this was one of the best curries we had. Tucked away down some side streets we were served about 8 different veggie curries, each with their own combination of spices. 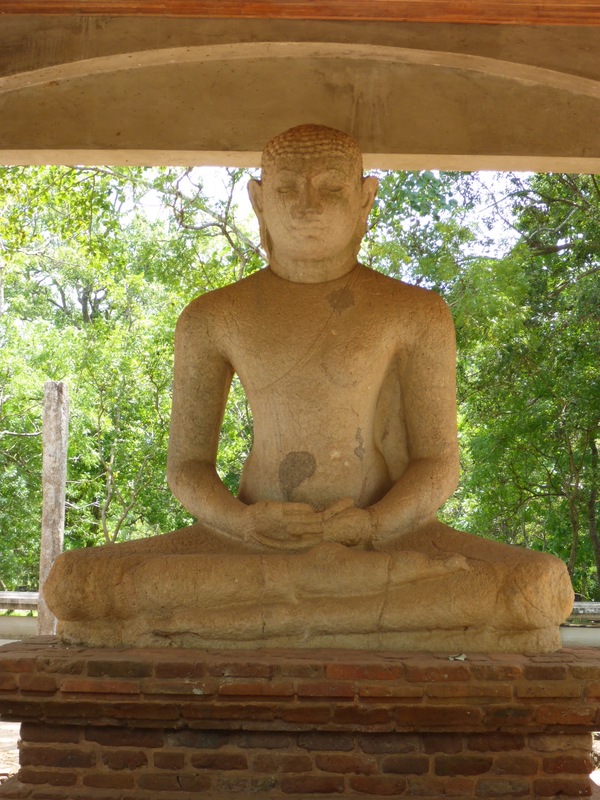 We’d seen everything we wanted to by mid afternoon and caught the bus to Dambulla and a tuk tuk to our guesthouse in Habarana (Wild View Resort). On arrival the heavens opened and we decided to just eat at the guesthouse. Most places will do evening meals and breakfast which makes things easy if you are arriving later and pretty tired! It also means you get traditional Sri Lankan food = yum! 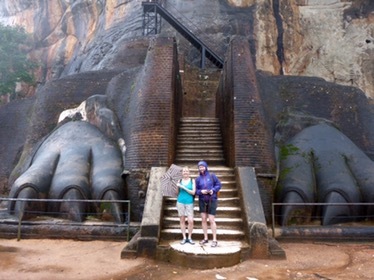 In hindsight staying in Dambulla would have been easier for exploring Sigiriya Rock and Dambulla Caves but we were put off by the description in the Lonely Planet. If you don’t have a ‘driver’ there is nowhere to leave your backpacks when exploring the sites. 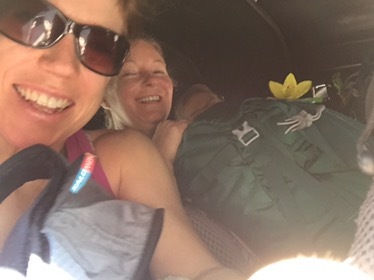 We were keen to get to Kandy after our sightseeing and decided having a tuk tuk to drive us round the sites, keep our rucksacks and drop us in Kandy was going to be the best option (5000 LKR). The owner of the guesthouse had organised a driver but unfortunately he had to go to a funeral so the owner took us instead. A perfect example of how helpful the locals are. 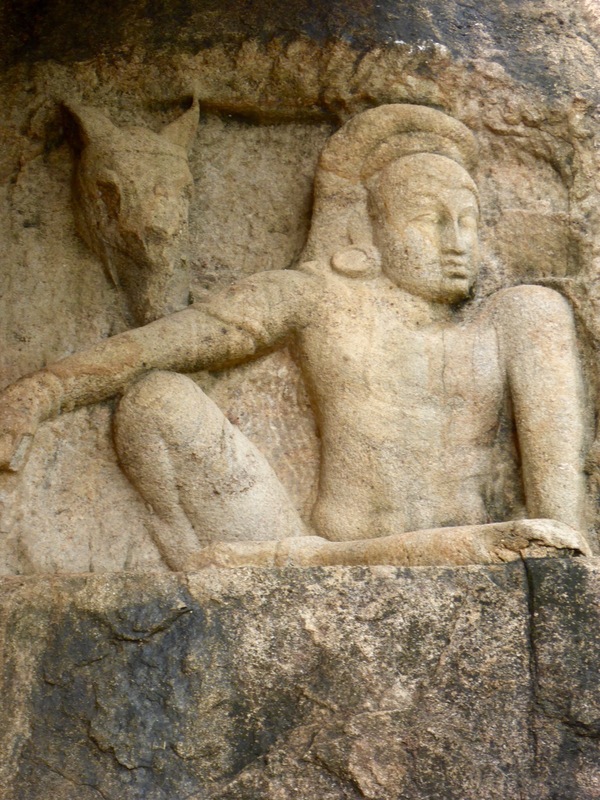 Sigiriya is a big rock, rising 200m above the jungle. Part way up a plateau features a gateway to the top in the form of a massive lion. On the top are the ruins of a palace and you can only marvel at how it was constructed in the 5th century. 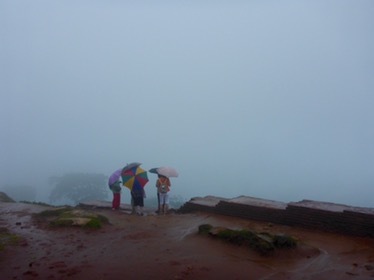 As optimistic people we had high hopes it would clear by the time we got to the top but we ended up soaked through. Unfortunately it meant we didn’t hang around a lot to look at the frescoes and explore the gardens, moats, water pools and caves. We had a couple of minor mechanicals with the tuk tuk but there was always someone at the side of the road ready to help. 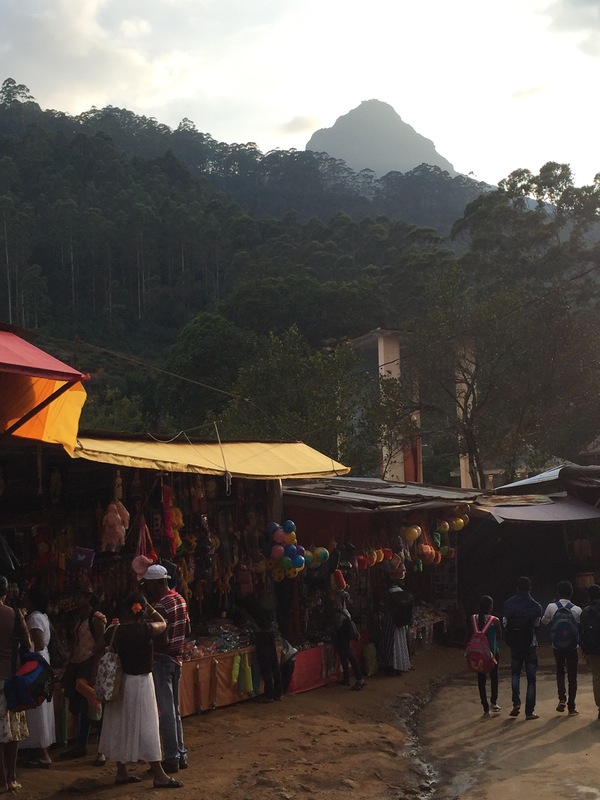 The roads are lined with wee shacks selling fruit and veg and we got some supplies on route to Kandy. When we arrived at the Kandy Hill Escape guesthouse, we caught the last of the sun looking out at the hilly jungle from the balcony and munching our way through the fruit. This included a new one that we still don’t know the name of (doesn’t appear to be an English name). 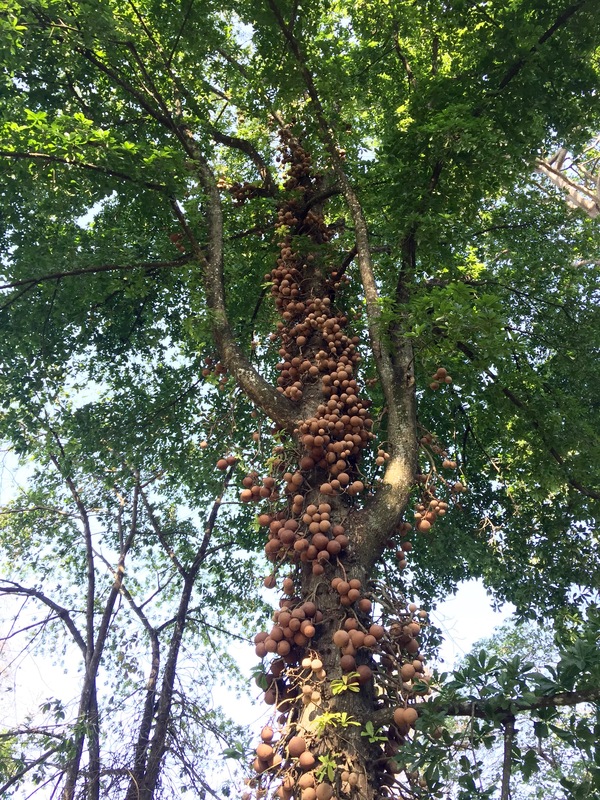 Kind of like a small jackfruit but with white flesh. Equally as sweet and sticky! We were perched up on the hill and walked into town for some food at the Muslim Hotel. Super cheap, big portions and very tasty. One of their specialities is Kottu – chopped up roti with veg mixed through. Our bizarre breakfast experience – papaya juice with salt in it. The hosts take such pride in their cooking that you don’t want to offend by not eating/drinking but we did wonder if this was a mistake! 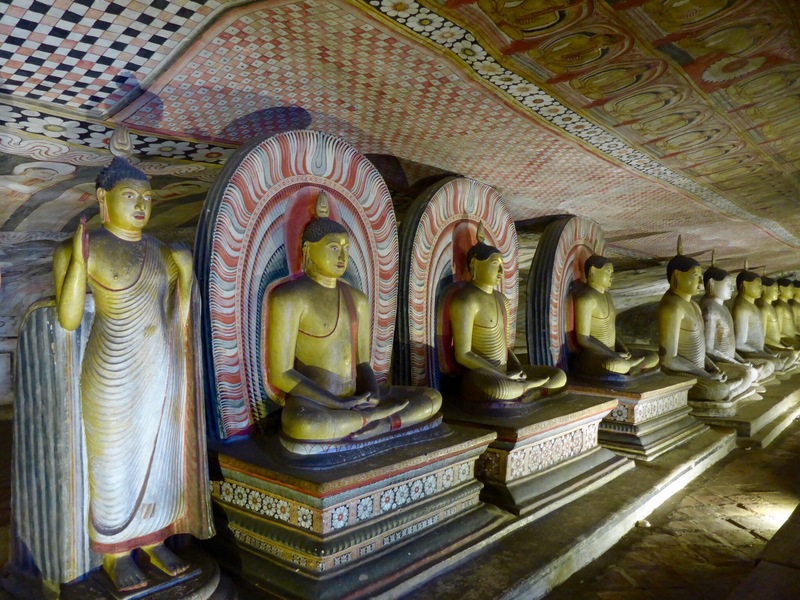 Kandy is nestled amongst the hills and known as the cultural capital because the sacred tooth (the tooth of a Buddha) resides in the temple here – considered Sri Lanka’s most important Buddhist relic. 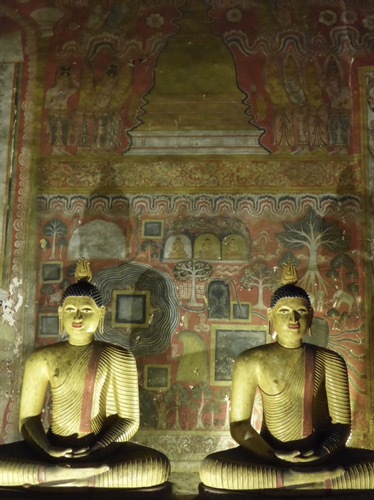 We didn’t go to see it as needed a day wondering about rather than being in temples. 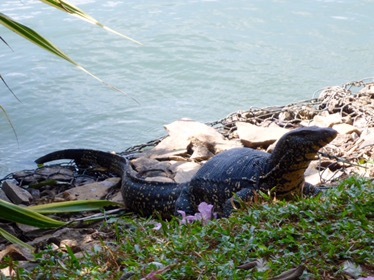 We took advantage of the first coffee shop of the trip (Sri Lanka is all about the tea) and walked around the lake watching the monitor lizards recharging their solar panels in the sun and cormorants diving for fish. We had a second visit to the Muslim Hotel for food and wandered round the botanical gardens. With any busy city, I usually find the gardens are a great place if you need a bit of tranquility amongst the hustle and bustle. 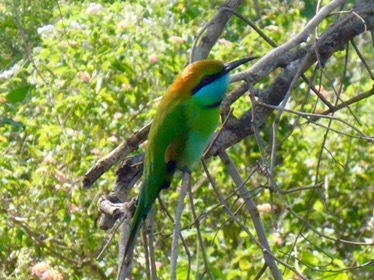 Lots of interesting things including canon ball trees and a colony of 22,000 flying foxes. It was Tracy’s birthday and friends had recommended going to Helga’s Folley for a drink – a hotel high up on the south side of the lake and described as a mix between Dali and Gaudi. Very bizarre place, not sure it’s really worth it. 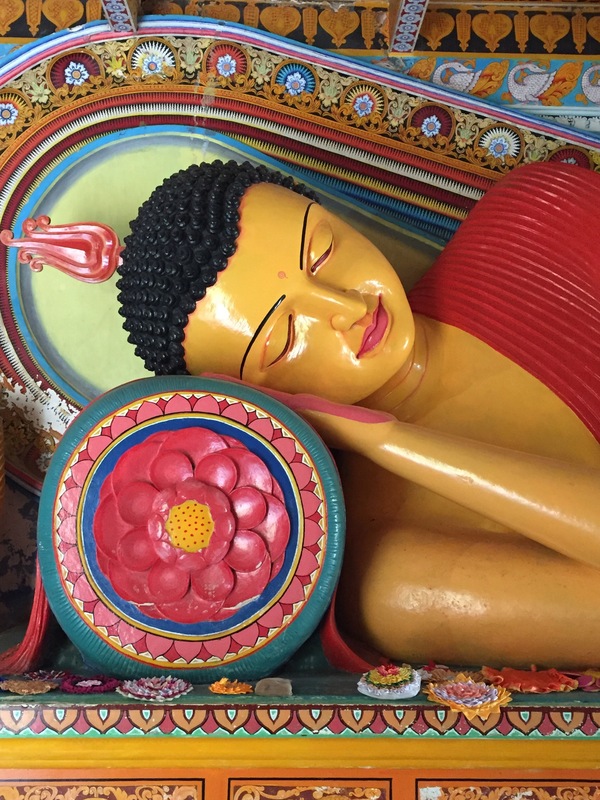 Adam’s Peak, also known as Sri Pada (Sacred footprint of the Buddha) and Samanalakande (Butterfly Mountain; where butterflies go to die) is a 2243m mountain which is a pilgrimage site, especially important for Buddhists. 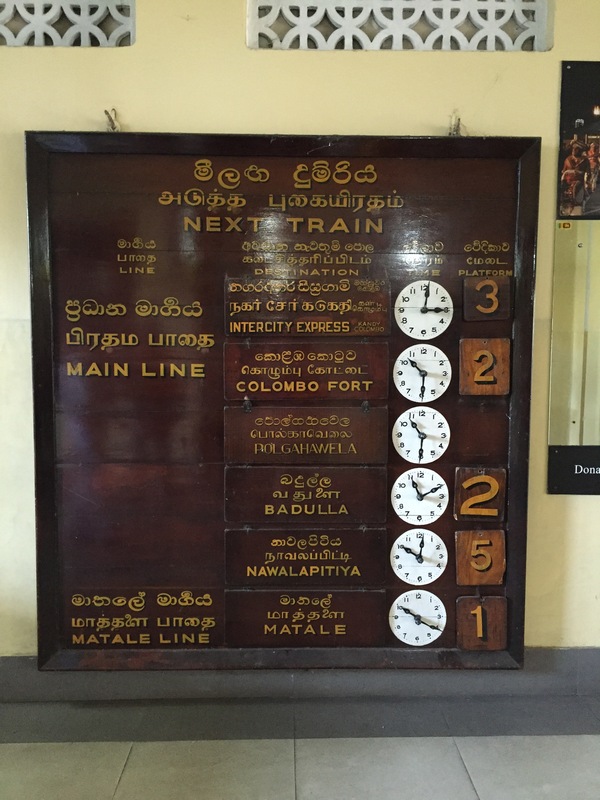 You start the climb from Nallathaniya and the first part of this journey involved getting the train from Kandy to Hatton. Tickets for the observation carriage sell out weeks in advance; we’d left it too late and settled for unreserved 2nd class. We followed our host’s advice and got to the train station an hour early to buy tickets but there didn’t seem to be much point to this. We were among the first on the platform but by the time the train came, the platform was pretty full and it was a rammy to get on the train. The train was already packed when it arrived at Kandy and we ended up standing. Our carriage was full of students from Colombo, also on their way to Adam’s Peak, armed with bongo drums and loads of songs. It was a great atmosphere and definitely a perk of travelling with the locals, albeit missing out on sitting at a window taking in all the scenery. When we arrived at Hatton, the bus left from just outside the station and filled up within a few minutes. The tuk tuk drivers spun the usual yarn saying the bus takes hours and they can drive it in 1 hour (this is typical throughout Sri Lanka). We went by bus and arrived after just over one hour. 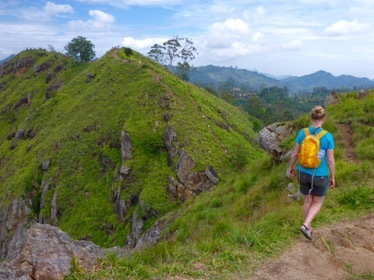 We’d read to avoid climbing Adam’s Peak during festivals and weekends due to the volume of pilgrims but when you’re only in Sri Lanka for 2 weeks we didn’t have much choice and arrived for a Saturday morning trek. 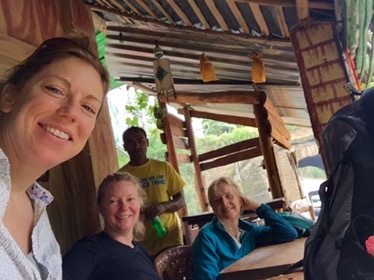 We had a wee wonder when we arrived, grabbing delicious rotis at one of the cafes, and walking down the start of the trail. 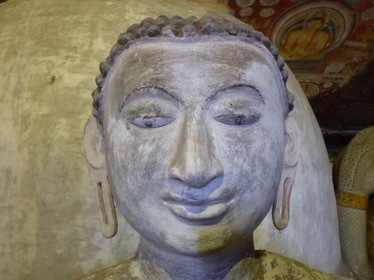 I wasn’t prepared for the lines of tatt stalls which are like the ones you get at fun fares, selling bright orange cuddly toys, other very random toys/posters/Buddhas with flashing lights, and high sugar snacks. There’s not such a choice of accommodation here and we’d booked into Daddy’s. Lots of development going on so options likely to increase over the next couple of years. We grabbed tea at the guesthouse (dreadful) and had an early night to try and rest up before our early start. We’d read to start at 2am to make it up for sunrise. While most of the tourists seem to aim for this, bus loads of locals were arriving every few minutes and there was a steady stream of people of all ages setting off. Most of the locals were bare foot or in flip flops carrying plastic bags with blankets and food provisions, and wearing ‘ice caps’ (fleecy hats). We started off with a good pace. 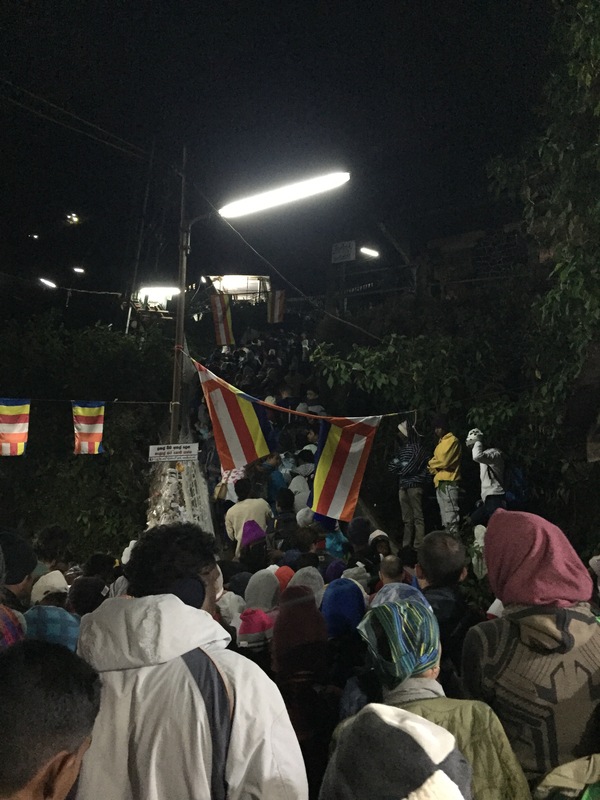 It was incredible being part of the pilgrimage and seeing wee kids from about 3 or 4 years walking without voicing any complaints, the elderly being helped up the 5000 steps by their family, and those who clearly don’t exercise climb a couple of steps and then just stop or sit down in the middle of the path. The path starts off pretty gentle and then you hit steep steps. We got about 3/4 of the way up and then hit a massive jam and were pretty much stationary for one hour. There was only a trickle of people coming down (mostly tourists who’d turned around) and weighing up the options we made the difficult decision to turn around and not make it up to the top. 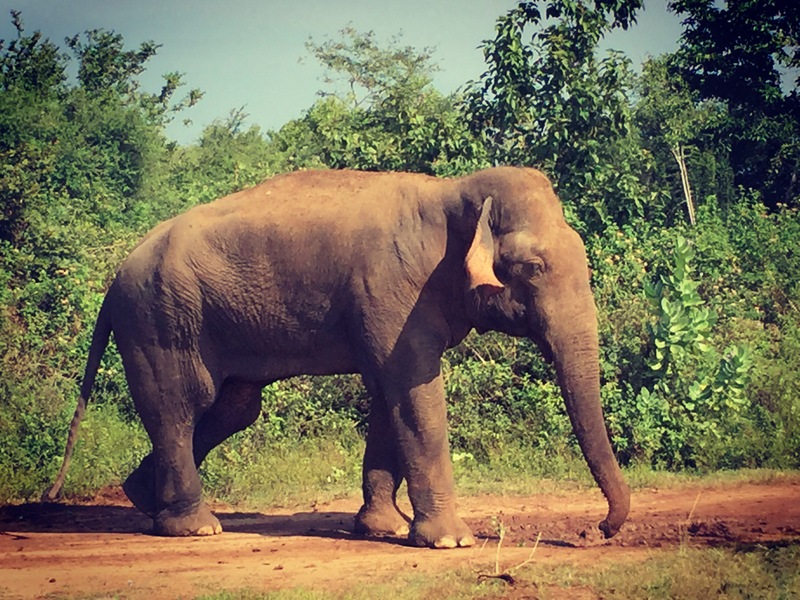 If we’d waited, we would have missed the train to Ella and taken a day away from doing something else. It was disappointing and our advice would be to strongly avoid going at the weekend if possible. We saw the guys from the train and it had taken them 7 hours to get to the top because of all the people. We caught the bus back to Hatton and for several kilometres the road was lined with buses that had transported the thousands of pilgrims. We jumped on the train at Hatton to Ella. Unreserved 2nd class again and after a wee bit of standing we all managed to get a seat and rotated who got the window. 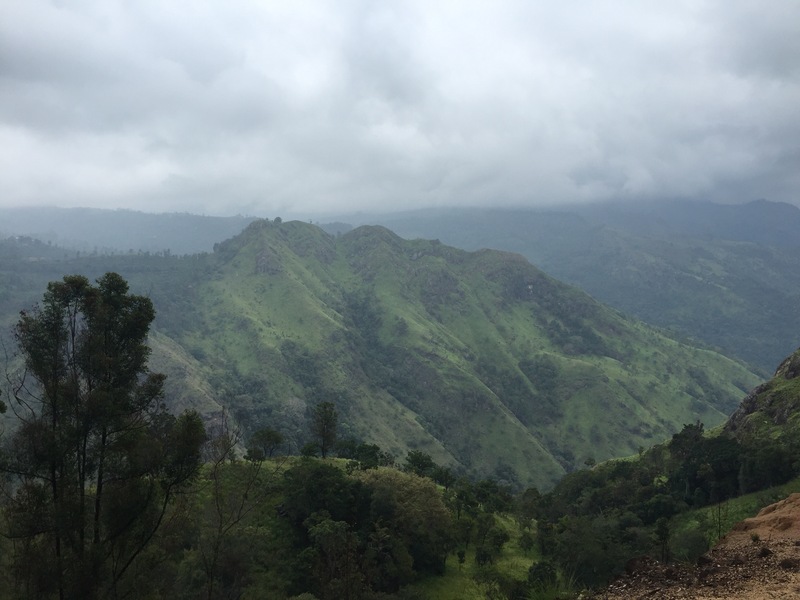 Great views as the train passed through villages and tea plantations. Vegetable samosas saved the day! 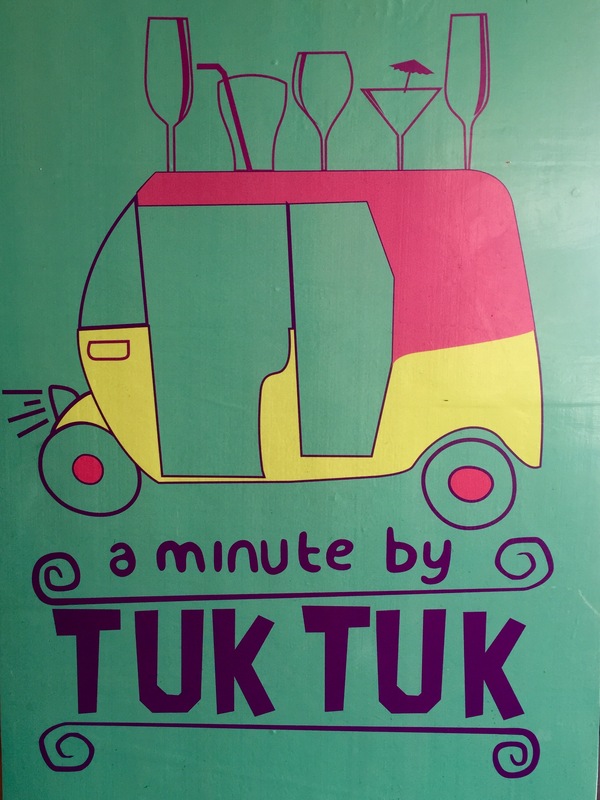 We arrived in Ella and caught a tuk tuk up the steep hill to our guesthouse Lucky Star. Much cooler here which was a nice change. Ella is set up for tourists and reminded me of some of the ‘backpacker’ hangouts in other countries, with nice cafes and restaurants selling a mix of local and some western food. 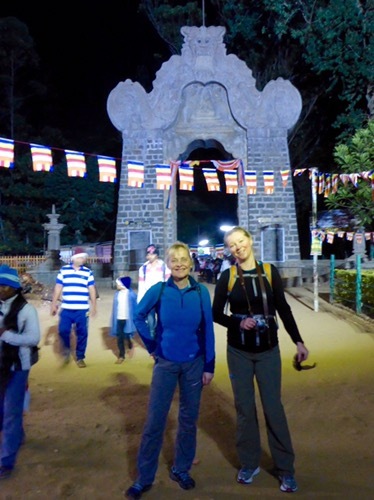 After our failed ascent of Adam’s Peak and the Sigiriya monsoon we had high hopes for Ella Rock. 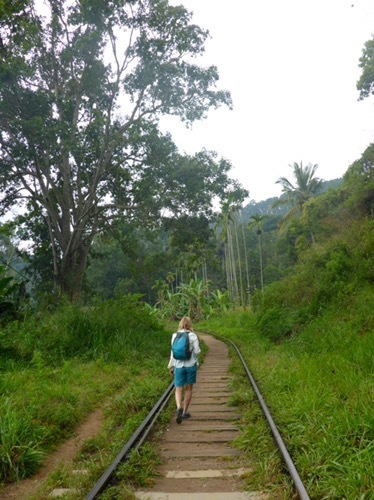 You get there by walking for just short of one hour along the railway track and then turning off left and heading up through the tea plantations until you reach the summit. 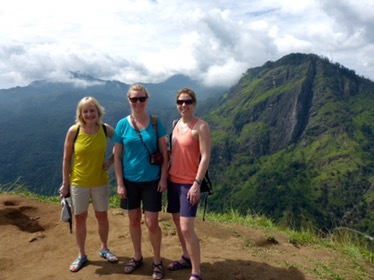 It’s a nice walk and when we got to the top we had a view over to Little Adam’s Peak before it turned to another pea soup day. There is a cloud forest on the top which is nice to walk through. Watch out for the trains while walking along the tracks. In both directions we had to get off the tracks and although they travel much slower than trains at home, still quite speedy! We went for lunch at Matays Cafe – a wee shack that serves up delicious curries and paratha. All cooked fresh to order and the best curry yet! 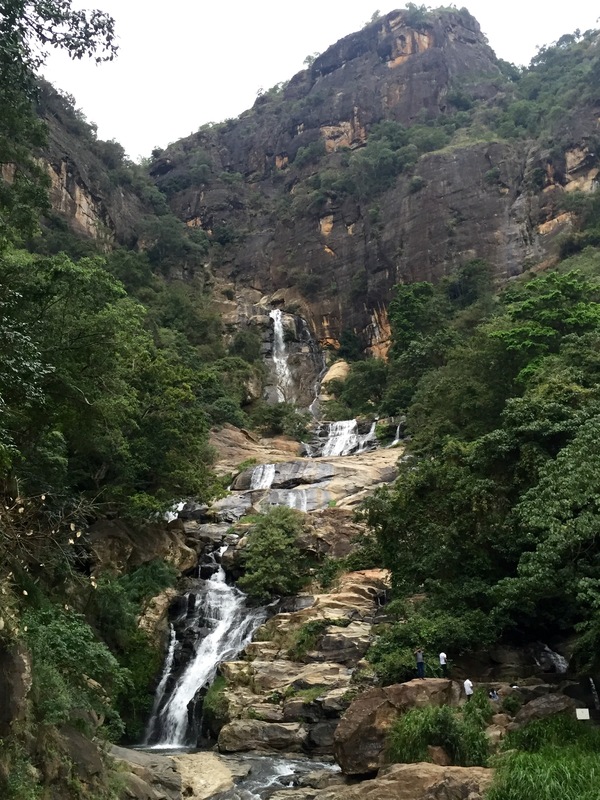 Ella is popular for hiking and waterfalls. I’ve always got low expectations for waterfalls after visiting some of the world famous ones. We walked down the road for 6km to Rawana Ella Falls and this was a great nature walk with heaps of monkeys and birds just off the road side. 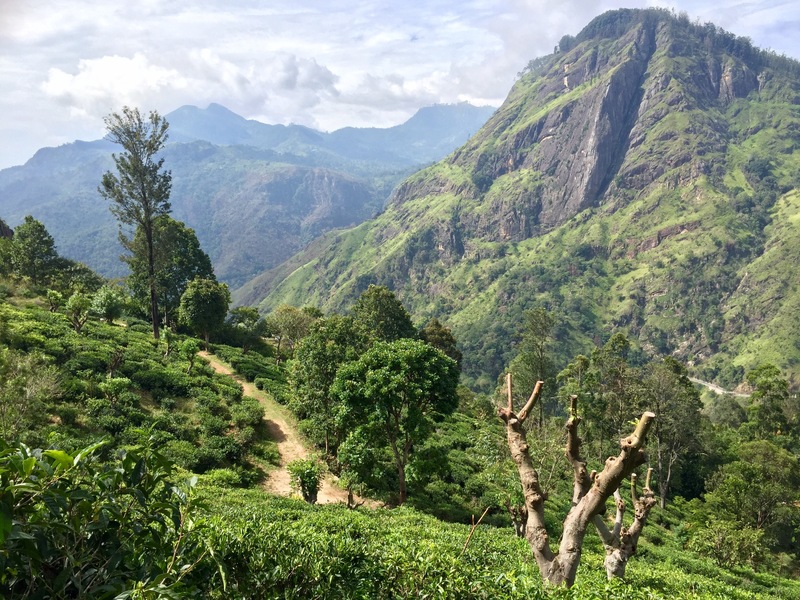 We climbed Little Adam’s Peak in the morning and this time we got a view! 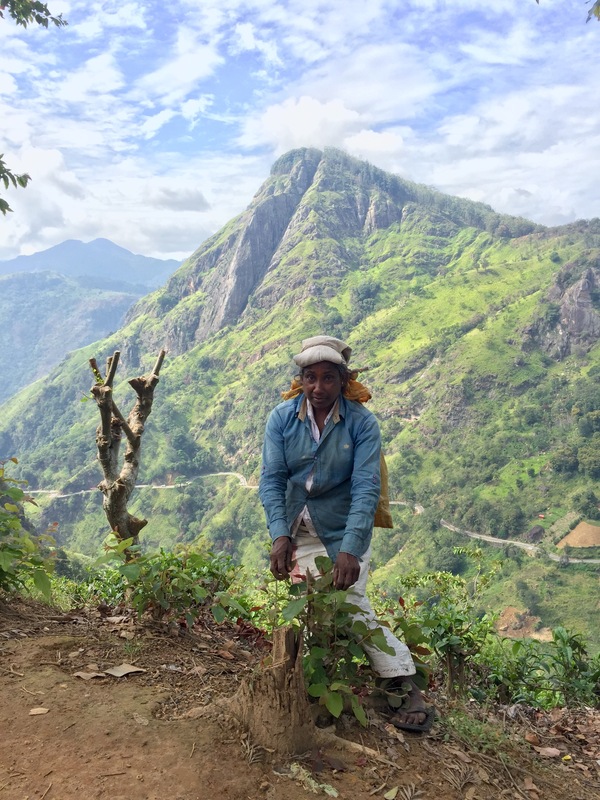 A path gently winds up through tea plantations with Tamil women out picking leaves. They fill up big sacks with the handle looped over their head. The path steepens and it was sweaty climbs to the different tops. We stopped for a fresh juice at the swanky 98 Acres Resort on the way down and the mist started rolling in. 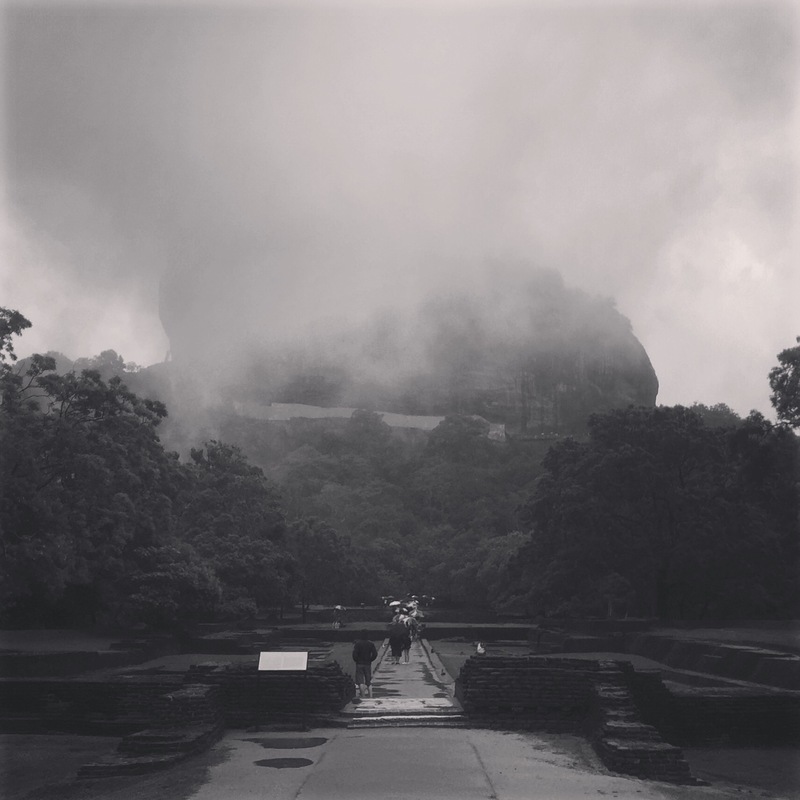 Before long, Little Adam’s Peak and Ella Rock were under their blanket once again. We couldn’t resist another lunch at Matays. Next up was safari. I’ve been spoiled with several African safaris so left it to the other two to decide on the safari park. 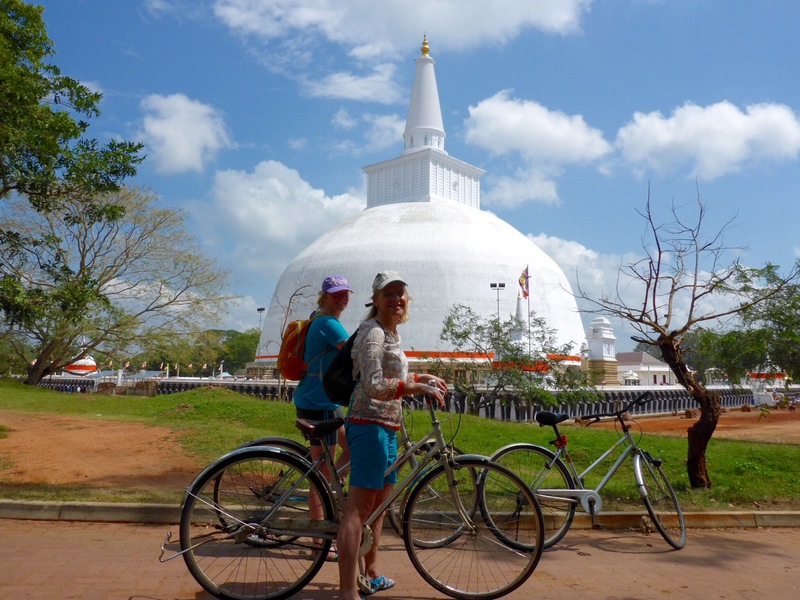 We opted for Udawalawe and got there by two buses – one from Ella to Wellawaya and then the Colombo bus from Wellawaya to Udawalawe. The buses are handy for getting around but blast out Sri Lankan pop, peep excessively and drive a bit crazy. 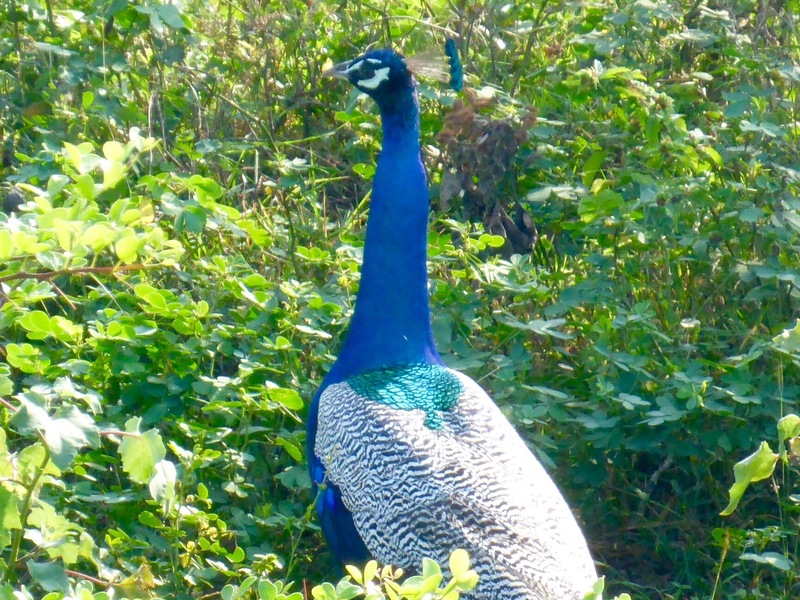 Like most buses, we were glad to get off, although did see a few elephants, monkeys and peacocks as we skirted the edge of the park. 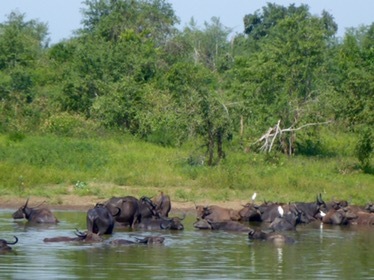 We stayed at Leesa Villa Safari Resort which was great. Would definitely recommend. The hosts were so friendly and the room was spotless. We sat out in the garden with a beer listening to the jungle noises. The husband has a safari jeep so we headed out at 6am the next morning and got a delicious breakfast when we got back. 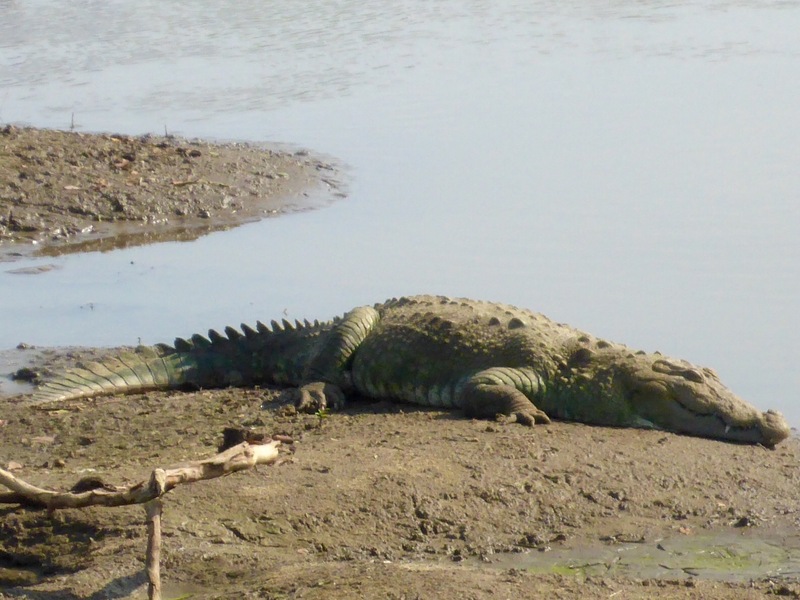 The park was great – loads of elephants, birds, lizards, water buffalo, crocs all within a relatively small area so you didn’t drive for long in between spotting the animals. On most occasions we were the only jeep which was perfect. We’d been non stop since arriving, trying to cram in as much as possible and had a few days on the coast the relax before heading home. 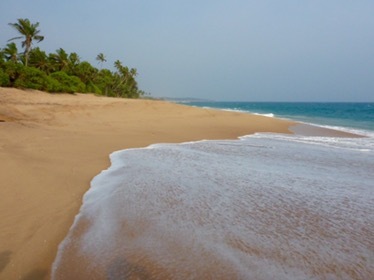 We decided to have a night in a less developed place and experience the more remote beaches. 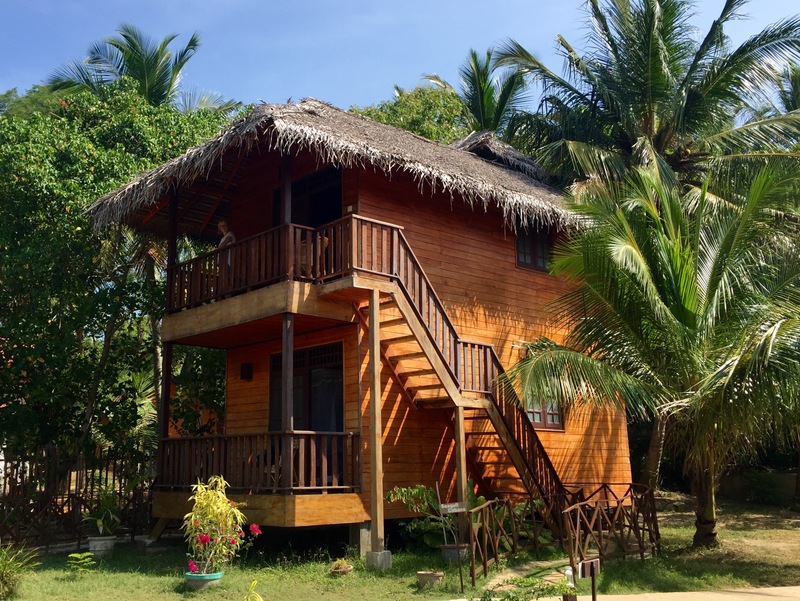 We stayed at Eco Cabanas in Marakolliya which was fabulous. We headed straight for the beach but like a lot in area, swimming was a no go due to the currents and we had to settle for paddling. Dinner options were a bit more limited in this area and we ended up at the Crocodile Grill which is attached to a large hotel on the beachfront. The menu and prices were geared to the tourist, with less local Sri Lankan food on offer. Unfortunately this was common at the coast. 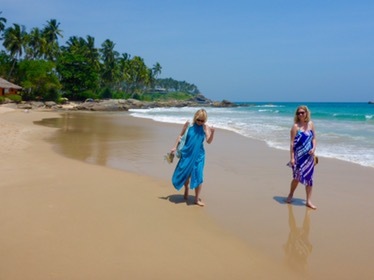 We needed a day chilling on the beach and decided on Goyambokka because it is safe for swimming. A picturesque cove with turquoise water, deckchairs and quite a lot of tourists! We are definitely spoiled on the west coast of Scotland where you are lucky to spot another person on the white sandy beaches. A day of reading, soaking up some rays and swimming in the Indian Ocean. 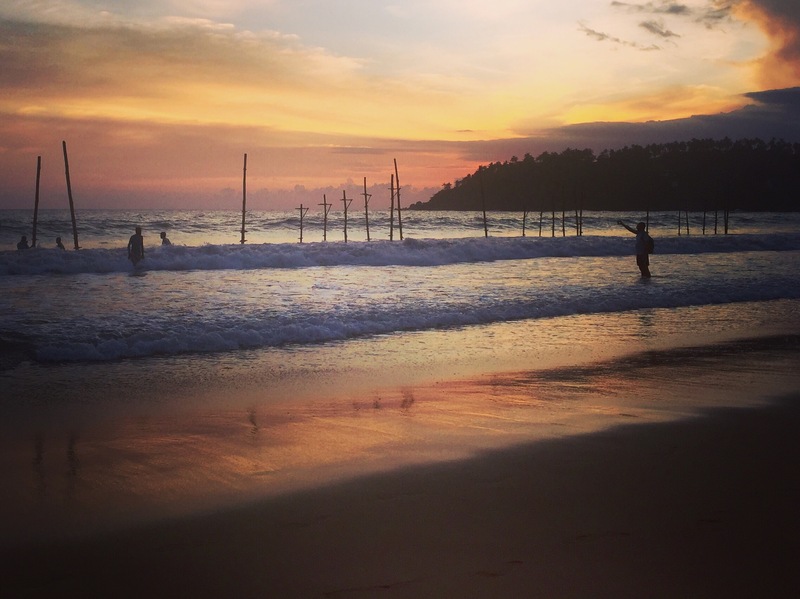 We finished up with 3 nights in Mirissa. We had a great room at Maya Guest House and were grateful for the AC – much hotter on the coast. We headed down to the beach for tea and first glimpse was of a strobe light, music pumping, illuminated palm trees and numerous restaurants set up on the beach. Not what I was expecting at all (guessing lots of recent development as my 2015 LP is definitely out of date for Mirissa) but not at the Ibiza stage (yet!). I couldn’t actually get a Sri Lankan curry and had to have a pizza! Still a relaxed vibe and hopefully there’s not much more development. 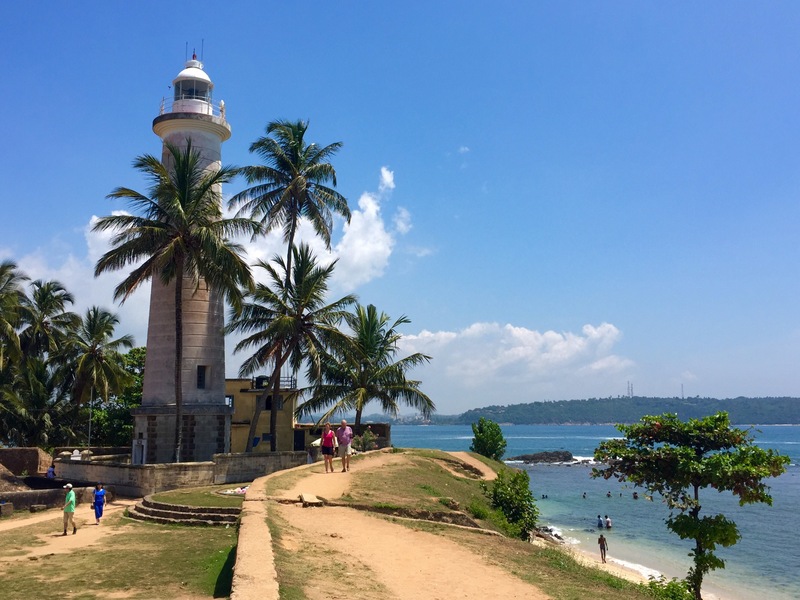 We caught the bus to Galle for a day trip. The historic Fort area is full of Dutch colonial buildings with the ocean lapping the walls around its perimeter. We walked along the wall before exploring the streets filled with nice shops and cafes. 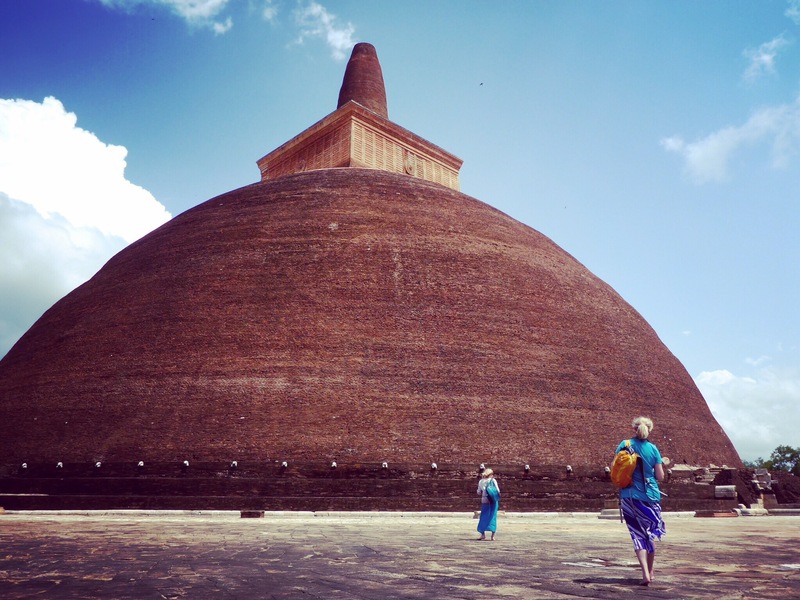 You almost forget you’re in Sri Lanka. Take swimmers with you as we didn’t and there were some lovely sheltered swimming spots. We went blue whale watching with Raja and the Whales after a recommendation from a friend. They are more eco aware and support responsible and sustainable whale watching. There was quite a swell and I was glad I’d taken sea sickness pills – get Avomine if you’re in any doubt! 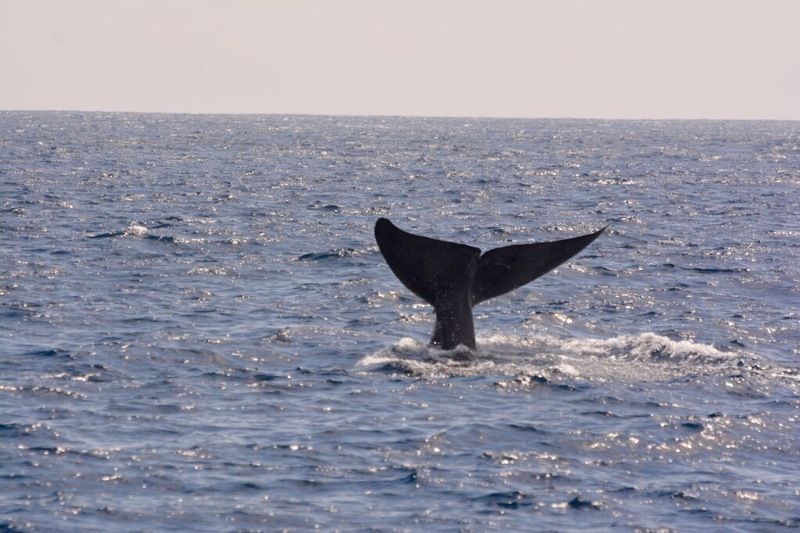 After sailing for about 2 hours we caught sight of a blue whale and watched as it came up to surface every 15 minutes or so before diving down again. Amazing to see them. 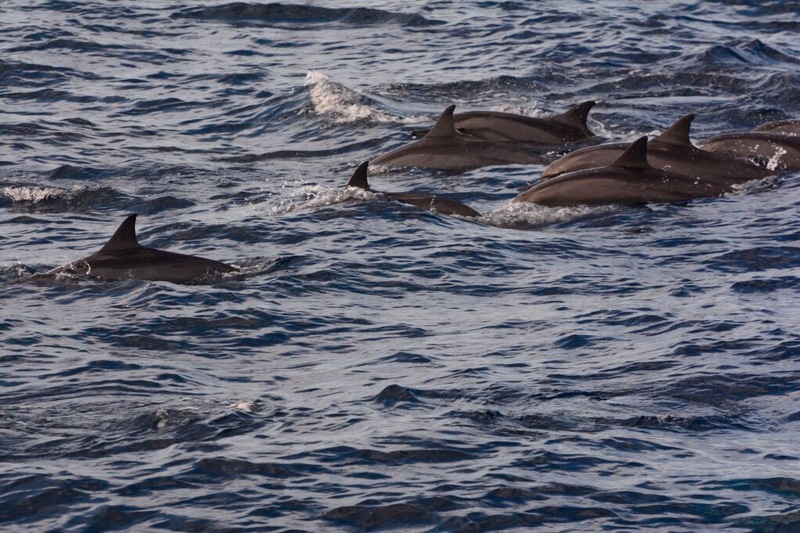 We also saw flying fish and a pod of acrobatic spinner dolphins. In the afternoon we went surfing at Weligama. First time without a wetsuit and it was brilliant! Almost lost the bikini a few times though. 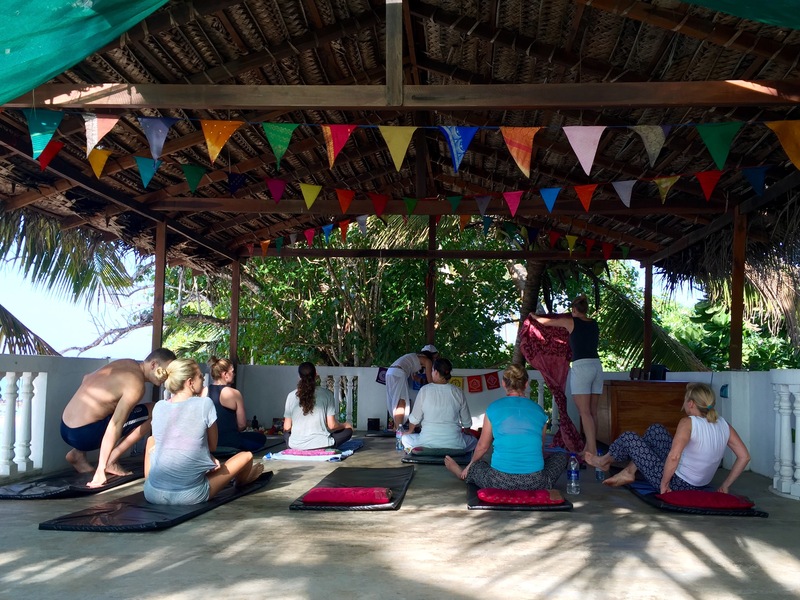 We’d spotted a sign for an early morning yoga class and headed along for a very relaxing start to our final day. What a setting! 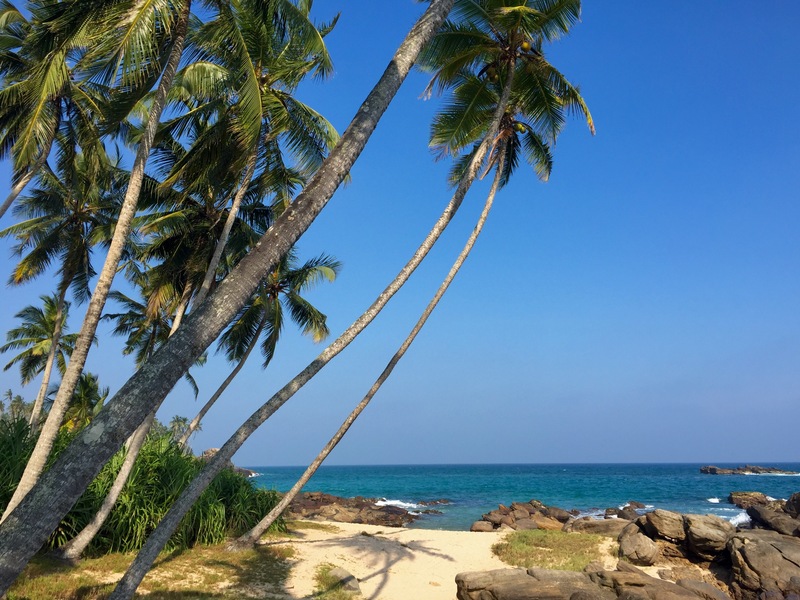 After a lovely brekkie on the beachfront we picked up our rucksacks and headed to Weligama for a final surf before heading home. 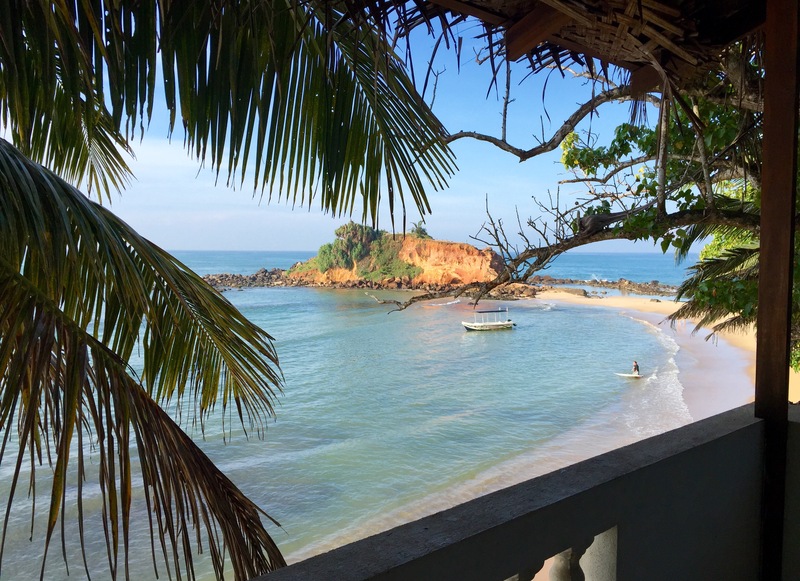 We’d booked a room in the Bee Nest in Negombo to have showers and try and catch some sleep before leaving for the airport at 2am. We’d planned to get the train to Colombo but the trains were off so we had a painful bus journey with the usual tunes blasting, peeping and scary driving. 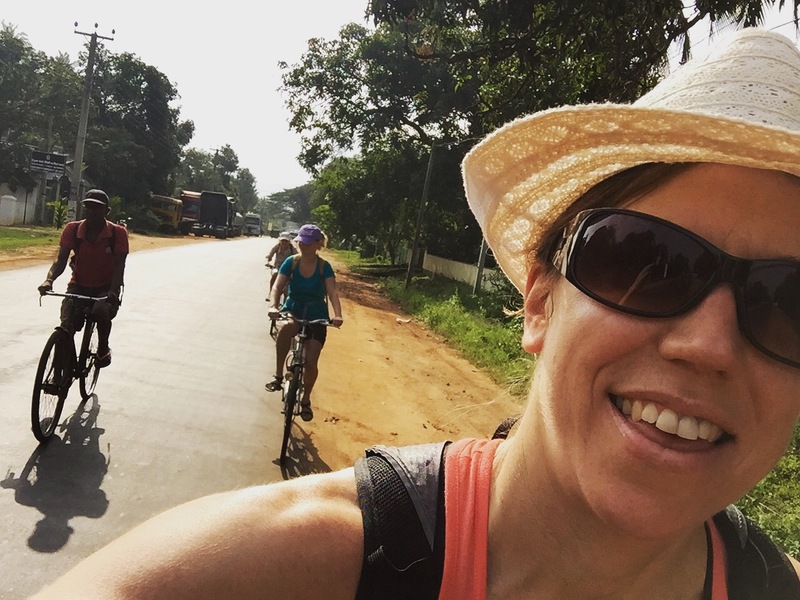 We caught a taxi to Negombo and a few hours later were at the airport boarding our flight. This was an absolutely cracking holiday. You can certainly cram a lot into 2 weeks but there are plenty reasons to go back. 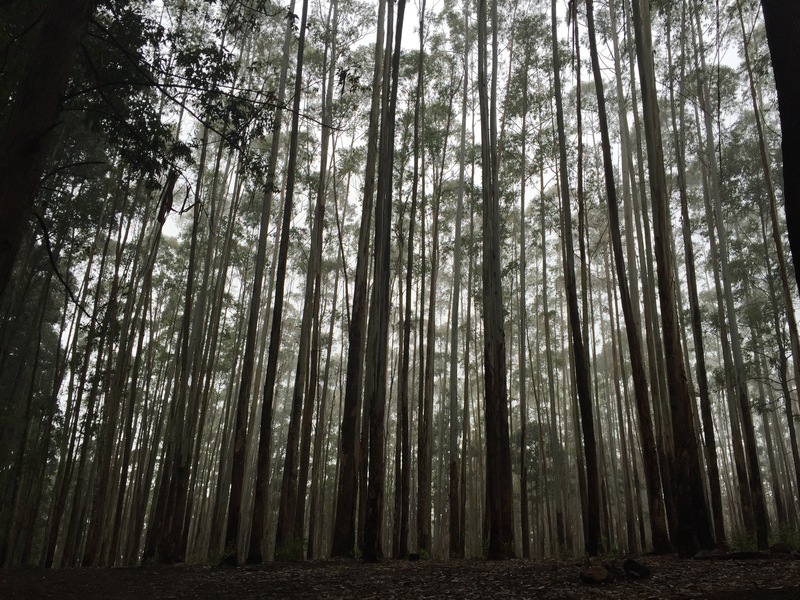 There’s hiking in the Knuckles range, the east & north parts of the country, the friendly faces and of course the food…..veggie heaven. Yum! This entry was posted in Outdoors, Travel and tagged photography, Sri Lanka, Travel, travel blog, travelphotography, wildlife on 26/02/2017 by Mangoventures.